On those days that I make something absolutely so delicious but in such small servings that it’s hard to leave some for the chef who comes home way past midnight, I make him this soup. (My secret is out!) Red lentils cook very quickly so this was done in no time! Plus they are also a very good source of protein. It is another meal that is ready within half an hour and you only need to dirty one little saucepan. I don’t know for you but that makes it super cool for me- especially since this steward is the official dishwasher of the chef and steward kitchen! 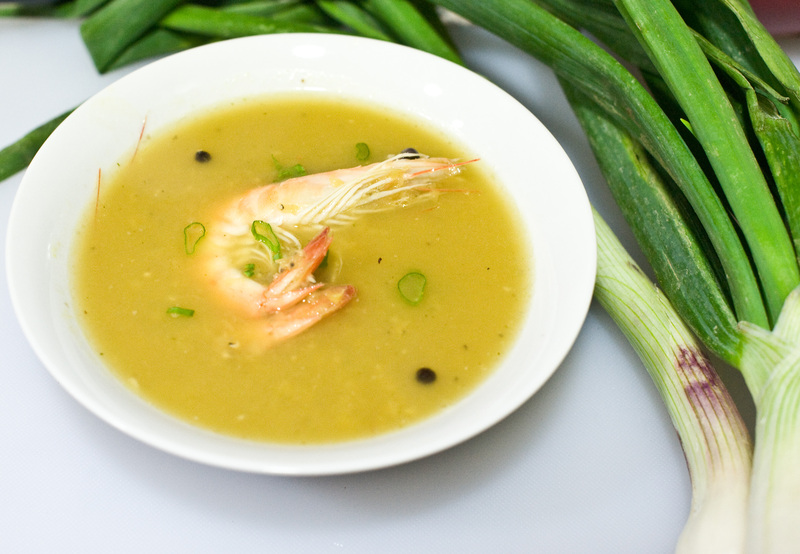 Ingredients: 1 cup red lentils, 1.5 cup chicken stock, allspice, bay leaf, spring onions (scallions) and one shrimp for garnish. Method: Cook the lentils in stock until tender with allspice and bay leaf. Add shrimp and cook for another 3 minutes. Garnish with thinly sliced spring onions Serve and enjoy! Leftovers may be frozen for a moment of hungry desperation. CHEF’S NOTE: Turn this into a vegetarian soup by cooking with a seasoned vegetable stock and leave out the shrimp. You may garnish with spring onions for a little splash of colour. The one 2011 resolution that I just may be able to keep (thanks to you) is eating healthy or should a say making a HUGE effort to eat healthy. Thanks for taking me one step closer by making it interesting. Two questions though 1)would red lentils be the same as yellow spilt peas or is that something totally different 2)how do you make seasoned vegetable stock? Much love….keep the posts coming. 1/2 cup onion, 1/4 cup celery and 1/4cup carrots (so 2 parts onion to 1 part each of carrots and celery). This is enough for 5 cups of water. Bring to boil, reduce to simmer and cook for 30 minutes. Please tell us how it goes!. Love your site and thanks for the recipes. I’m a baker so hence I like measurements. Can you please tell me how much Allspice you put in the above soup recipe. Never made soup with Allspice before but can hardly wait! Thanks for sharing! Reblogged this on Chef and Steward. wow red lentil came out beutiful light green color! How beautiful!! I’m not a chef but I love to cook of course eat, too! I’ve cooked with green lentil before but it took some time.. Definitely I should try red one! Thank you for sharing your recipe! This shall be made in our home this week for sure. This is a beautiful soup and the recipe couldn’t be simpler. I’m always excited to discover new lentil recipes, since the tiny legumes are such a staple in our house (like you said, they cook quickly!). My family will be surprised to see something so elegant on the table, especially if I make it on a weeknight. The shrimp is a perfect garnish and boosts the excitement of this dish.